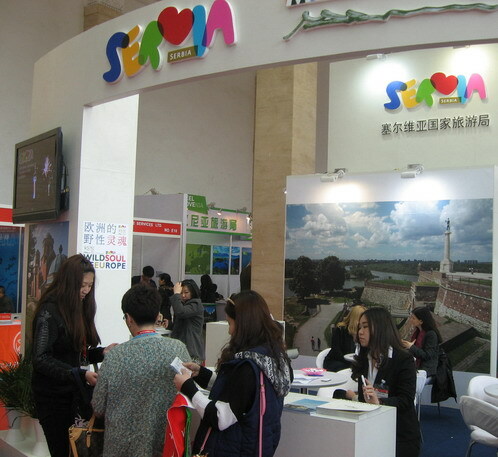 (Beijing, 12 April 2013) At the international tourism fair in Beijing (China Outbound Tourism Market), held from 9 to 11 April 2013 in Beijing, Tourist Organization of Serbia presented the tourism potential of Serbia. TOS unveiled a new brochure on Serbia in the Chinese language to the visitors of the Fair and presented measures, such as visa facilitation, that sparked increased interest of Chinese tourists in Serbia in the last year. In 2012 number of Chinese tourists visiting Serbia was 39% higher than in the 2011. At the Fair in Beijing TOS Stand was very well positioned and equipped, had a lot of visitors, and won the award for the most beautiful stand. The fair was attended by more than 200 tour operators from 60 countries.